Allotments are London’s hidden wildernesses. While they are cultivated gardens rather than wild-growing expanses, these patches of gardens – where people who otherwise might not have access to a garden are able to grow vegetables and fruit – are miniature wild spaces in this sprawling mega city. Allotments hum with activity in the spring, summer and autumn, as owners tend to ripening crops and a hundred and one other small jobs. They’re intensely communal places, with all the friendships, rivalries and minor dramas of a small village. Getting your hands on a small patch of garden is no mean feat. In some of them can take years. I had passed the allotment in Greenwich many times before I knew what it was; the garden is hidden behind a large metal gate. My wife’s workmate owned a garden, and one summer weekend a few years ago he invited us down for a look round; it was time to inspect the beehives he kept there. The Greenwich allotments are a short flight – at least as the crow flies – from the huge green space of Greenwich Parks. The bees are drawn to the wealth of plants and flowers, pollinating far from the confines of the walled garden, and returning to create honey within the hive. 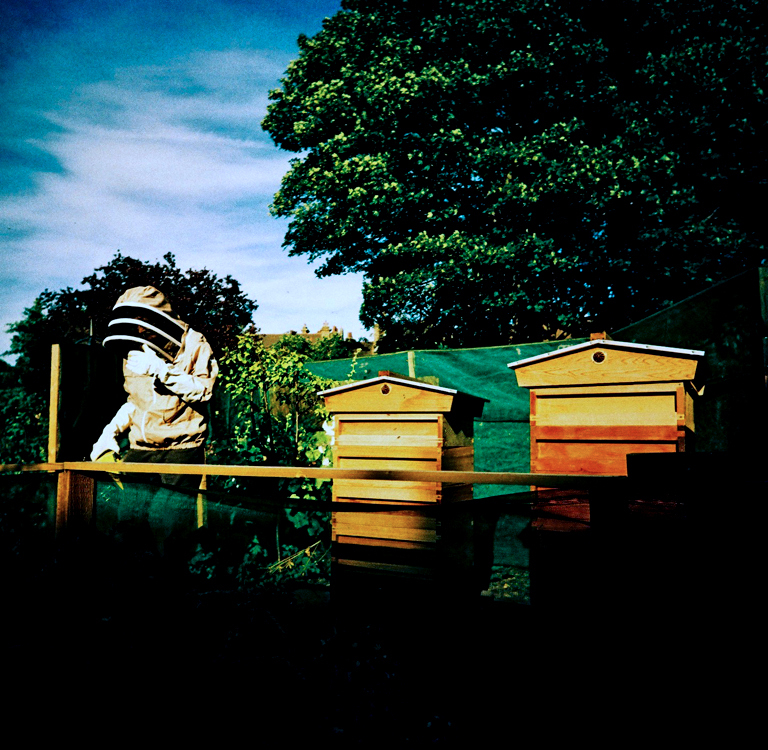 I knew this visit might yield some good photos – even if I was going to be covered in protective gear to keep the bees at bay – so I decided to bring along my Lomo LC-A 120. It’s light, easy to use, and the scale focusing means no fiddling about trying to get razor sharp focus – just pick the closest focusing scale. The camera’s relatively modest widest aperture of f4.5 also helps. I’d loaded the camera with Lomography’s Xpro Chrome 200 – in reality Agfa’s old RSX 200-ISO slide film. It can of course be shot as an E6 film, but Lomography have packaged it to be shot as a negative film, boosting contrast and warping the colour palette. I like too how the white of the beekeeper’s uniform balances the two hives, with the blue of the textured sky adding a nice element to the top of the frame.